Daily Illuminator: #PlayMunchkin At Your Local Store This Saturday! November 18, 2016: #PlayMunchkin At Your Local Store This Saturday! The best thing about the holidays is getting together with friends and family, and playing games. And beating them at games. And taking the loot. What I'm saying is, the best thing about the holidays is Munchkin! To celebrate our favorite time of year, we've stocked nearly 200 game stores with our #PlayMunchkin Holiday Retailer Event kit, including unique swag like promo cards and bookmarks. What better way to celebrate the season than hanging out with friends and other fans at your friendly local game store, playing some Munchkin, and getting free loot? Check out our list of participating retailers, and swing by to play tomorrow – Saturday, November 19. While you're there, check out the newest releases from our Holiday Vault. Munchkin Christmas Lite, Holiday Surprise, Yule Log, and the Jolly Jumbo D6 just came out of the vault, but only through the end of the year! Get your stocking stuffers now! Don't forget to share pictures from your local event with the hashtag #PlayMunchkin on Twitter, Facebook, and Instagram! Not only will we share them, you'll be entered to win Munchkin prizes the following Monday. #PlayMunchkin is the gift that keeps on giving! 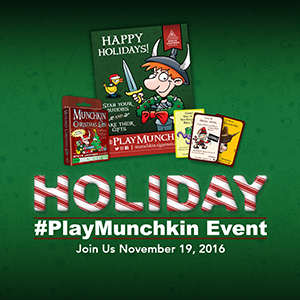 We'll see you tomorrow, November 19, at the #PlayMunchkin Holiday Event!